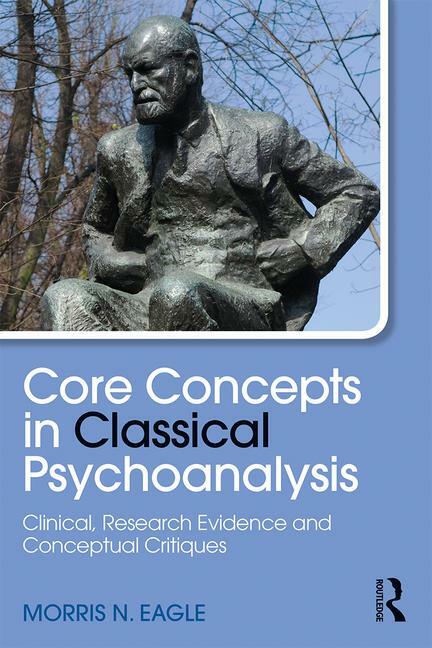 In Core Concepts in Classical Psychoanalysis, alongside its companionpiece Core Concepts in Contemporary Psychoanalysis, Morris N. Eagle asks: of the core concepts and formulations of psychoanalytic theory, which ones should be retained, which should be modified and in what ways, and which should be discarded? • Unconscious processes and research on them- what evidence is there for a dynamic unconscious? • Is there a universal Oedipus complex? Unlike other previous discussions of these concepts, this book systematically evaluates them in the light of conceptual critique as well as recent research based evidence and empirical data. Written with Eagle’s piercing clarity of voice, Core Concepts in Classical Psychoanalysis challenges previously unquestioned psychoanalytic assumptions and will appeal to psychoanalysts, psychoanalytic psychotherapists and anyone interested in integrating core psychoanalytic concepts, research and theory with other disciplines including psychiatry, psychology and social work. "These two works, both 'Classical' and 'Contemporary', should be in the library of every serious student of psychoanalysis and the psychoanalytic therapies. Applying his wide-ranging critical intelligence to decades of empirical research and cross-disciplinary scholarship, Morris Eagle evaluates seminal psychoanalytic ideas with verve and incisiveness. His comprehensive integration is easy to read, persuasive, and – rare in the professional literature – fascinating. "-Nancy McWilliams, PhD, ABPP, Visiting Full Professor, Rutgers Graduate School of Applied & Professional Psychology. "In order to prosper it is important for any complex theory in psychology to undergo evaluation of its core constructs to ascertain which aspects have received support, clarify areas in need of modification and also, if we are to be honest and fair, identify those elements that need to be jettisoned. In both 'Classical' and 'Contemporary', Eagle undertakes such an examination of psychoanalytic theory in a thoughtful, clear and incisive review of research evidence, clinical material and conceptual issues. Be forewarned, this is no rubber-stamp of or love letter to psychoanalytic theory. To the contrary, it is a balanced and often critical review of psychoanalytic constructs discussed in an experience-near descriptive manner, eschewing meta-psychological jargon, delivered with a good deal of wit and skillfulness that is typical of Eagle's previous work. Agree or disagree with his conclusions, any serious psychoanalytic scholar or student will benefit a great deal from the discussion contained in these volumes and be much better situated to help psychoanalytic theory evolve and thrive in the contemporary mental health landscape. "-Mark J. Hilsenroth, Ph.D., Professor, Derner School of Psychology, Adelphi University. "Morris Eagle’s thoughtful, probing, and insightful writings have long stood out as examples of the finest thinking the psychoanalytic tradition has to offer. Bringing a remarkable clarity and rigor of thought to reexamining some of our most fundamental concepts and assumptions, Eagle offers fresh insights that both affirm and challenge analysts of all stripes. These two books, Classical and Contemporary, the capstone of a long and brilliant career, are virtually a blueprint for how psychoanalysis can survive in the coming decades. "-Paul L. Wachtel, Ph.D., CUNY Distinguished Professor, Doctoral Program in Clinical Psychology, City College of CUNY. "The clarity and richness, the thoughtful analysis and overall assessment of where psychoanalysis stands in these two books by Morris Eagle makes them indispensable for all psychoanalysts and psychoanalytic therapists who are concerned for the future of our field"-Otto F. Kernberg, Professor of Psychiatry, Weill Medical College of Cornell University; Director of the Personality Disorders Institute of the New York Presbyterian Hospital (Westchester Division), Training Analyst at Columbia University Center for Psychoanalytic Training and Research of New York and Past-President of the International Psychoanalytic Association (IPA). Morris N. Eagle, Ph.D. is Professor Emeritus, Derner Institute for Advanced Psychological Studies, Adelphi University and is in part-time private practice. He is the author of From Classical to Contemporary Psychoanalysis: A Critique and Integration and many journal articles. Morris is former President of the Division of Psychoanalysis of the American Psychological Association and recipient of the Sigourney Award, 2009.